Hey whats'up Guyz Today Samsung Notebook 7 Spin in for review, and battery life is still impressive but its looks are a bit ho-hum. The Samsung Notebook 7 Spin jumps into a crowded hybrid market and is hoping to take a bit out of it as best as it can. 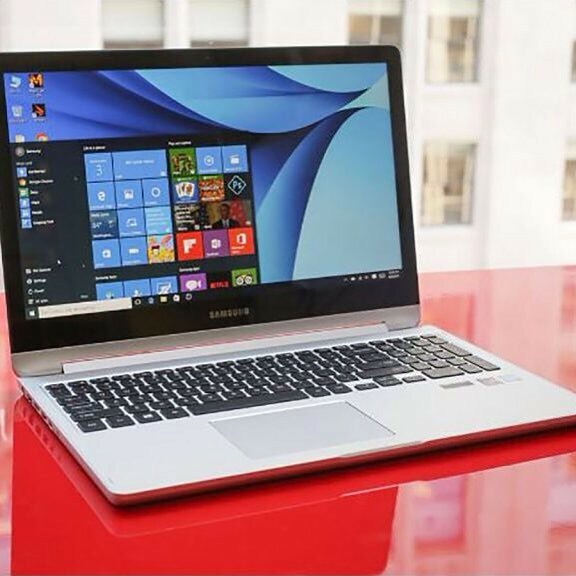 Read on for the full review of the 2018 Samsung Notebook 7 Spin. Starting on the bottom, you’ll find the four rubber feet for stability on a hard surface. There’s also a nice long rear vent for pushing heat away from the internals. Finally, there are two speakers on the bottom, but more on those later. Not much to see on the lid, other than the Samsung logo. Over on the right side, you’ll find the microphone array, the fingerprint sensor, and one USB 2.0 port (this really should have been 3.0). Over on the left side, you’ll find the barrel port DC jack, HDMI port, USB 3.0 port, USB-C port, and headphone/mic jack. The addition of that USB-C port was a great move by Samsung. Finally, this is a hybrid laptop so you have the ability to flip this into a tablet work environment. You can also use it in text mode, or presentation mode and having this multiple options of use is going to appeal to some users. Colors on this panel are slightly oversaturated. Blacks are nice and contrasty with whites fairly clean and crisp. Reading the text on this panel was comfortable, everything was sharp and easy to distinguish. Overall, this display has nice color, great blacks, and whites, but the lower nit rating means it will have a few issues in direct or bright lighting.